My rambunctious, fun loving, joy filled son turned 11 today and we had a small gathering to celebrate. I asked him what he would like on his pizza and he requested Chicken and Spinach Alfredo Chicken. I had never made it before and was not sure how much sauce to add to the pizza, but I was pleased to find that this was nearly perfect! It would have been even better with bacon! Next time! To make pizza dough, dissolve the yeast in the warm water in your kitchen Aid stand mixer, if you are lucky enough to have one. Add the vegetable oil and sugar to the yeast. Add 1 cup of flour and 1 tsp of water to the mixing bowl. Use the paddle attachment and mix until the ingredients are well combined. Add the remaining 2 cups of flour to the dough, and switch to the hook attachment and knead until all the flour has worked into the dough and it looks smooth and elastic, about 2 minutes. Remove the dough from the hook and pour about 1 teaspoon of oil over the dough, turn the dough to coat it with the oil. Cover the mixing bowl, first with a piece of plastic wrap and then cover with a clean kitchen towel. Allow to rise for 30-45 minutes. It should double in size. In the meantime roast the chicken, seasoned with salt and pepper, in the oven (I used skin on, with bone chicken breasts) and roasted them at 375 for about 40 minutes. I allowed the chicken to cool off about 20 minutes, so it was cool enough to handle. Preheat the oven to 375 for the Pizza. Place the dough on a pizza stone (I love my pampered chef one- in this case I used their large one that has a lip). I sprinkled the dough with dried oregano. Next, I ladled about 1 cup of sauce onto the dough and spread it out. 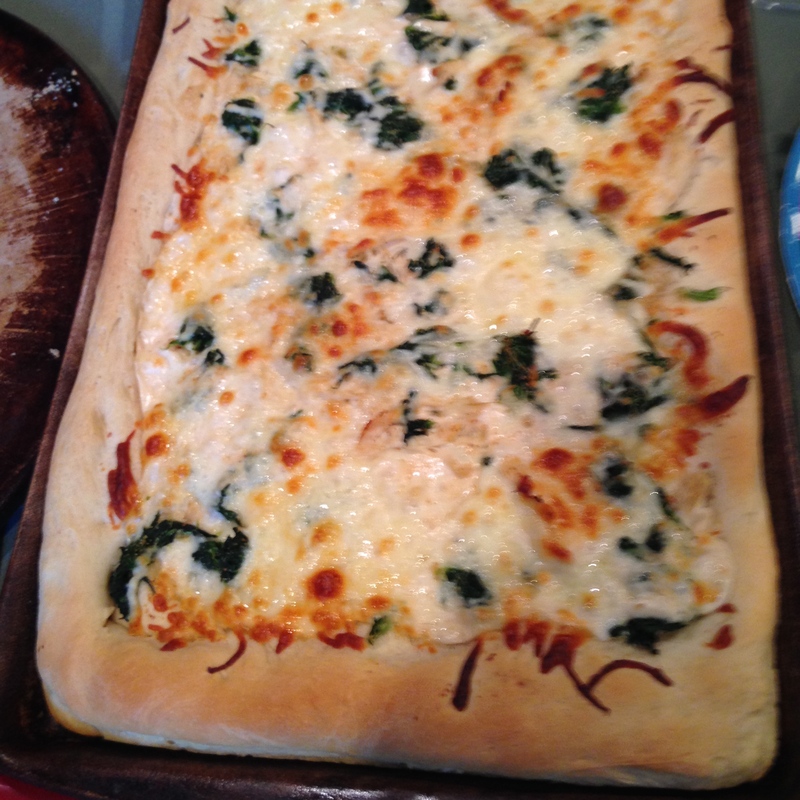 I then dotted the dough with pieces of spinach (be sure to wring it dry before using it – I like using the chopped frozen spinach because you can remove the moisture – which would be hard to do if using fresh). I pulled the chicken skin off and pulled the meat from the bone and pulled the meat apart into bite size pieces, placing them all along the top of the dough. Next, I sprinkled garlic powder over top the pizza and chicken. Sprinkle with bacon pieces if you are using them (I will next time). I drizzled about 4 tablespoons of Alfredo sauce over the top of the chicken again and topped it with the shredded cheese. Bake at 375 for 20-25 minutes, or until the cheese is golden and bubbly. Categories: Ethnic, Ethnic - Italian, Main Dish, Main Dish - Chicken | Tags: Chicken Alfredo Pizza, Chicken and Spinach Alfredo Chicken, Homemade Pizza, Pizza | Permalink. Nearing dinner, I looked in my refrigerator and found a pound of ground beef. I did not want to make the same old same old and turned to Pinterest for inspiration. I came across the recipe for Korean Beef at the website of Elizabeth Bryant (link). It looked simple enough, and I had the basic ingredients needed in my refrigerator right? Well, actually, I had to send my husband to the store to get my green onions (my hero!). The Korean Beef came together quickly and was delicious with steamed rice and steamed broccoli (which hubby also picked up because he was going to the store already!). Korean Beef is usually made with flank steak, but this ground beef option was very good. This dish is simple enough, my 11 year old son could cook with supervision. It is easy and delicious. I will be making this again and again. Thank you Elizabeth Bryant for posting this to Pinterest. Brown the ground beef in a large non stick skillet over medium high heat, breaking up and stirring the beef with a wooden spoon. When the beef is mostly cooked, drain off any fat and stir in the chopped garlic and grated ginger. Cook stirring for about 1 or two minutes or until the beef is completely cooked through. Remove any additional fat if needed and add the sugar, soy sauce, crushed red pepper flakes and stir. Just before serving stir in the green onions and serve over hot steamed rice and broccoli on the side. Categories: Ethnic, Ethnic - Asian, Main Dish, Main Dish - Beef | Permalink.